Dimensions 24.0 In. X 4.0 In. X 4.0 In. To be honest I chose this rug for the incredible price point. It was going in r I’m with a lot children and dog traffic and didn’t want to spend a lot of money. To my surprise it is gorgeous and very good quality. It’s super soft and durable even with my German Shepherd. The color is a true gray (no blue undertones). I wasn’t sure when I saw the photos but it’s the perfect soft gray. I LOVE this rug. I highly recommend it. I am very pleased with this rug. The color is true to the photo, great price and great quality. I needed an area rug for our house down the cape and I took a chance on this and was pleasantly surprised. It is nice and thick, comfy to walk on, and the dog to play on. I liked it so much, I ordered 2 smaller ones for the eating area. The color is grey with a slight bluish tinge. Sorry for the sideways pictures, Overstock edit function wouldn't work. Beautiful rug! Grey is light in color, while the white is not a bright white, it is definitely not cream in any way. Thicker in pile so it feels really good underfoot. 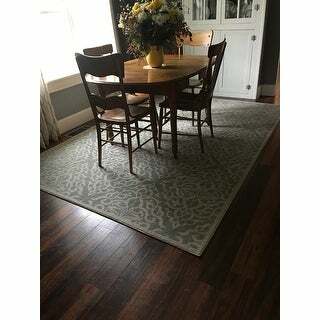 I purchased this rug for my dining room which has a wood floor and is grey and white with hints of yellow, and the rug is perfect! It is very true to the pics shown. It shipped quick and arrived packaged well with no holes and edges protected. It did take about five days for the end that was tighter rolled to lay flat. I have vacuumed it twice and no noticeable linting or fibers came off so it is very well made. I did not order a non-slip rug pad just because of where it is in my house but if you purchase this for an area where there is high traffic I would definitely suggest doing that as it does slide around on my wood floor easily. 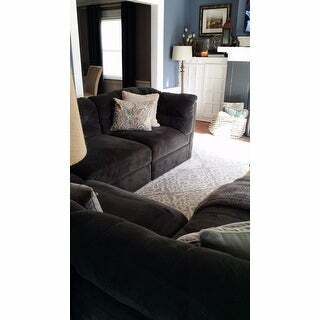 We are very pleased with this AND it was my very first OVERSTOCK purchase ever. 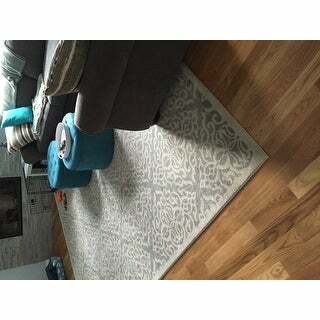 Overall great rug for high traffic area (especially with kids), looks very pretty and modern, the only reason I gave it a 4 instead of a 5 star rating is because the picture shows a darker color of the grey/silver but in reality it's very very light silver color, especially in a very light room. The quality, color and pattern are great. 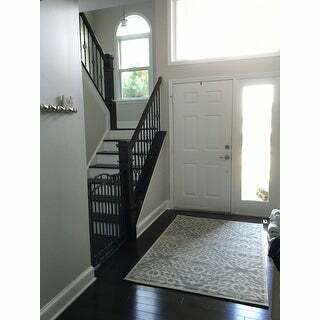 This rug is so elegant and looks perfect in our entry way. 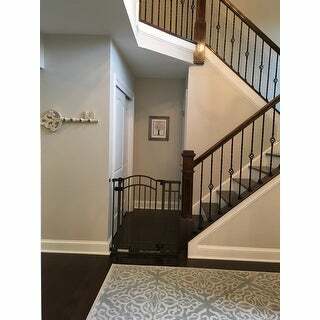 I love the light grey color and it's very durable which is perfect since it is by the door. 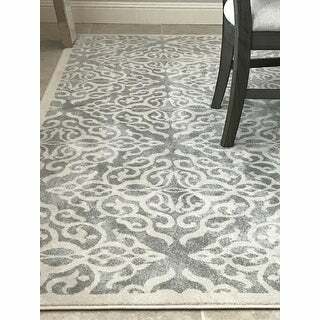 It's a thin rug, which is perfect with a non-slip rug pad, and the grey has a slightly two-toned or speckled look to it. Overall I love the rug & get lots of complements on it! Perfect addition to my living room. Love the color scheme and good quality. Very pleased nice size. Wrapped nicely for easy unpacking. Delivered right to my door. I love this rug. It’s such a beautiful color. It’s great quality! Highly recommend! It has been easy to clean and looks wonderful in my dining room. The colors go together well with my furniture. 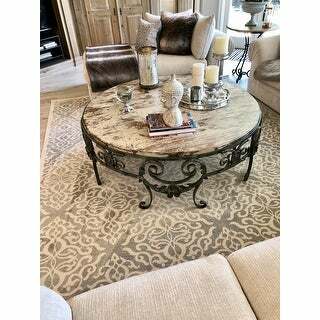 I have received so many nice compliments on this wonderful rug!! 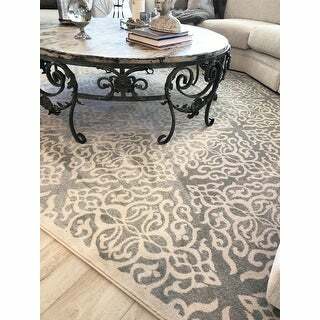 We love this rug! We bought it to go in our formal dining room. It arrived on time. Product and color was as described. little thin, but it’s plush, comfy and just as pictured. 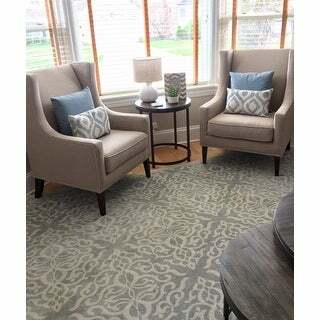 the gray color is absolutely beautiful and the design looks great either direction the rug is placed. we are extremely happy! This is an amazing rug! I love it! We placed it under our dining room table with a pad. It adds warmth to the room and cleans and hides dirt very well. I have 2 dogs and grandchildren and so far its holding up well. Very pleased and I would definitely recommend. This is a really pretty rug that's very true to color to the picture. Definitely a silver/blue, I paired it with *** on the wall. My only complaint is that overstock sent me a 15% off coupon and I still ended up paying *** more when it went on sale a day or so after I ordered it. Felt like the coupon wasn't worth anything and they knew it. I think they should do a price match if something goes on sale within 48 hours of someone buying something. This rug is so pretty. I put it in my bedroom. It's thick and great on the feet in the winter and because of the softness. Easy to vacuum. A lot of pillars at first but after a few its less and less. I would recommend. The color was nothing like pictured. 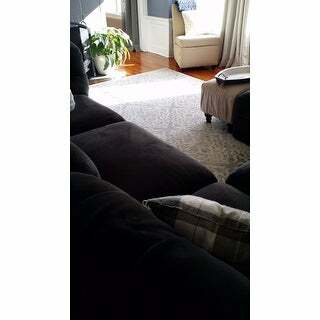 Shown is a light to medium gray contrasted with a light ivory. 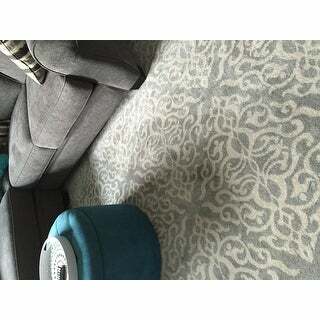 The rug I received looks more like a cotton light blue silverish color and ivory, pattern looks very washed out. 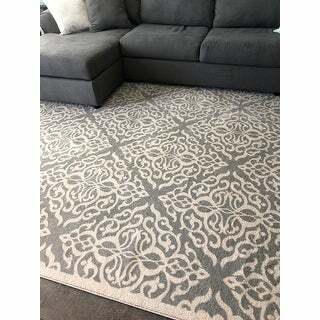 I'm very disappointed and now stuck with over *** in return shipping fees because the rug was incorrectly marketed. Be careful unless you want to fork out high return cost to Overstock when product wasn't as pictured. 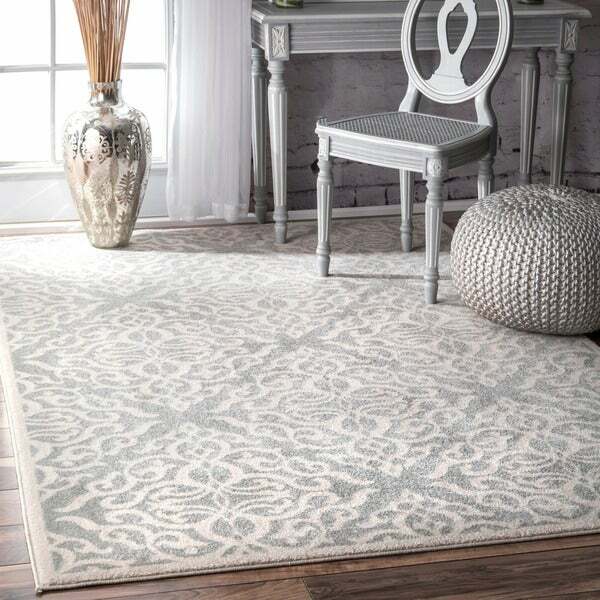 Beautiful plush rug goes great in a neutral room. I currently have it in my dining room. 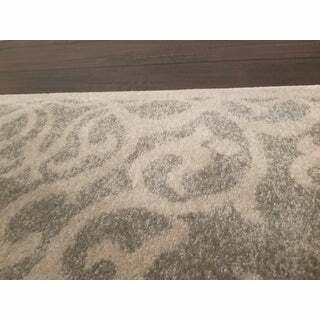 Just returned this rug, beautiful quality but it is definitely not silver or gray. My eyes saw more blue gray. Quality very good. Perfect size. Color is as in the picture, even better in person. "Will this runner come back in stock?" We hope to have this back in stock in March. 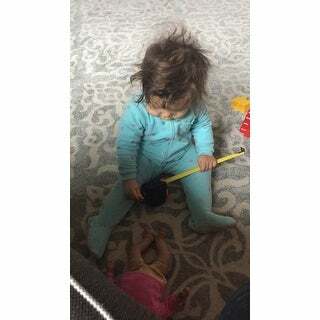 "Does this rug come in a smaller size?" "Will this be stocked anytime soon? " We expect it to be back in stock around mid April. "Does the white in the design look white or beige?" The background color of this modern medallion rug is ivory cream white. not a bright white. closer to ivory but not to creamy looking. "Is the pattern in this rug woven or printed?" It is woven and it is so beautiful very satisfied with my purchase. "The title says the measurements are 6'7 x 9 and the description says 6 x 9. What are the actual dimensions?" "Would you say this was a neutral gray, a bluish gray, or a greenish grey"